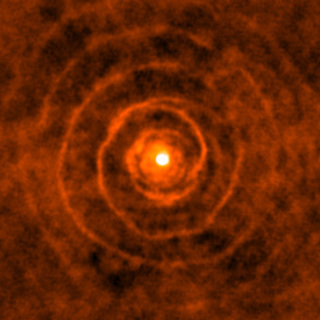 Credit: ALMA (ESO/NAOJ/NRAO) / Hyosun Kim et al. An international team of astronomers using ALMA has unraveled the elliptical nature of the binary orbit of the old star LL Pegasi and its companion. The figure shows the composite image of molecular gas around LL Pegasi. By comparing this gas distribution depicted in exquisite detail by ALMA with theoretical simulations, the team concluded that the bifurcation of the spiral-shell pattern results from a highly elliptical binary system. ALMA (ESO/NAOJ/NRAO) / Hyosun Kim et al.